Final touches are prepping String Riffs All Holiday Volume, String Riffs Volumes One, Two, and Three Accompaniment CDs with Miriam Hickman Live on Piano (performance ready!) and midi tracks with strings and piano. 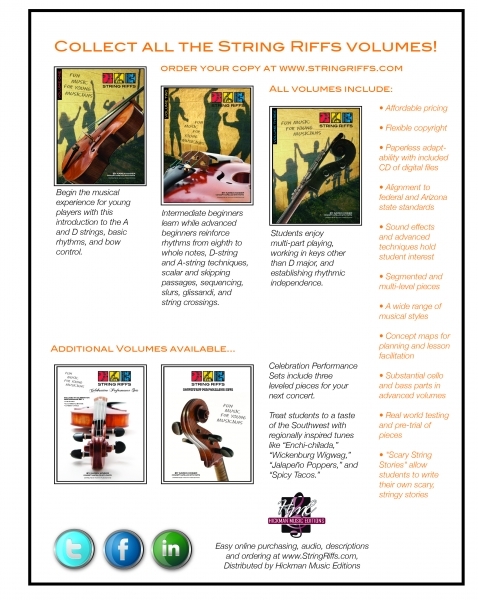 But wait, there are two more Volumes: Celebration Performance Set 1 with Tree Celli Mon, Heart Strings, and Click Beetle Boogie for Cello ensembles (what can I say? I am a cellist!) and Celebration Performance Set 2 with Avalanchia by my Dad, The Storm, and Jester’s Court For Jr H or HS students. I need to get back to the other String Riffs waiting to be formatted and finished, like Twitchy Latté and Sauntering Through a Dewey Meadow. Thanks for your support. I always love to hear back from you with your opinions, your students’ opinions, and even your audience’s opinions.